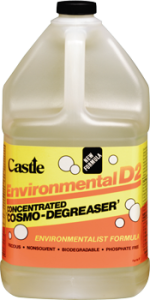 Ready-to-use Finger Lakes Environmental D-2™ is an environmentally conscious approach to degreasing parts and equipment. Alpha Terpineol, which is EPA approved under SNAP (Significant New Alternative Program), is the base ingredient used in the Finger Lakes formulation. 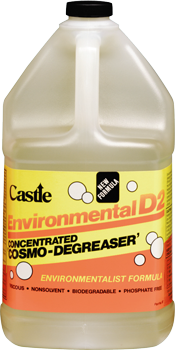 Environmental D-2™ will quickly and effectively remove grease tar, oil, and dirt from parts and equipment. Its water-emulsified formula is non-flammable, has a pH of 10.5 – 11.5, contains no chlorinated solvents or petroleum products, is biodegradable, non-caustic, non-corrosive, phosphate free, alcohol free, and contains no regulated VOCs. 2. Allow to sit for 5 to 10 minutes. 3. Rinse thoroughly with clean water. 4. Use only in well ventilated areas.